Colours contained in Set 209are Lilac, Yellow-Green, Gray, Medium Green, Light Brown, Blue-Green, Dark Brown, Medium Blue.. Ceramic decoration with unusual, effective styles and a variety of textures can be created with AMACO UnderglazeDecorating Chalk Crayons. 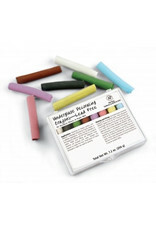 The 7cm x 1.1cm chalk crayons come in sixteen colors ranging from intense hues to pastel tones. Chalk Crayons can be used like pastels on bisque pottery,which results in a pebbled appearance. Colours may be blended or smoothed by rubbing with the fingers or a swab of cotton on a toothpick. Watercolour effectsare obtained by brushing sketches with water. For fine lines, the chalk crayons can be sharpened. Small pieces of chalk crayon may be dissolved in water for painting or spraying. Clear Transparent Glazes are recommended as a covering glaze. Sponge on first coat of clear glaze lightly in order not to smear the design. Let it dry and then brush on additional coats of clear transparent AMACO® glaze. This precaution is unnecessary if the glaze is to be applied by dipping or pouring. Pieces are fired to the maturing temperature of the covering glaze. When spray application of a covering glaze is desired, first refer to individual listingto be sure that it may be sprayed safely. NOTE: The maximum firing temperature is Cone 10 for the following: Black, Brown, Dark Blue, Dark Green, White, Gray, and Medium Blue. The maximum firing temperature is Cone 5 for the following: Turquoise, Yellow, Dark Brown, Blue-Green, Light Brown, Medium Green and Yellow-Green.The maximum firing temperature is Cone 05 for the following: Rose and Lilac.